Sinawe72 is a new home-makeover reality series that helps make the dream of four families come true by giving them a chance to revamp their homes. Sinawe72 starts on eTV on Wednesday 5 March at 5.30PM. Presented by renowned actor, presenter and filmmaker, Thapelo Mokoena, the show features four families from different parts of the country renovating their homes non-stop over a 72 hour period in their bid for the grand prize of R250 000 worth of building materials and products from Build It. Each team consists of four active members and one mentor/coach, known as the Build It Champion. The Champion is the overall leader of the team and, although not allowed to get physically involved with the work, he is there to motivate and guide the team. He is also fully responsible for the teams’ building plan. Each week on the show, the teams are also given an additional construction related challenge. Produced by Gray White Productions, the series runs over 13 episodes. Once the 72 hours of non-stop construction is over, the viewers’ vote for their favourite team and decide on the overall winner. The announcement of the winner is made at the end of the series. Says Monde Twala, e.tv’s Head of Channels: “It’s often difficult for most people to make changes to their homes to better their lives. Sinawe72 gives some relief by helping Mzansi families to live more comfortably and realise their dream homes. It’s a great show that gives back to the community and e.tv is proud to be part of this make over experience”. 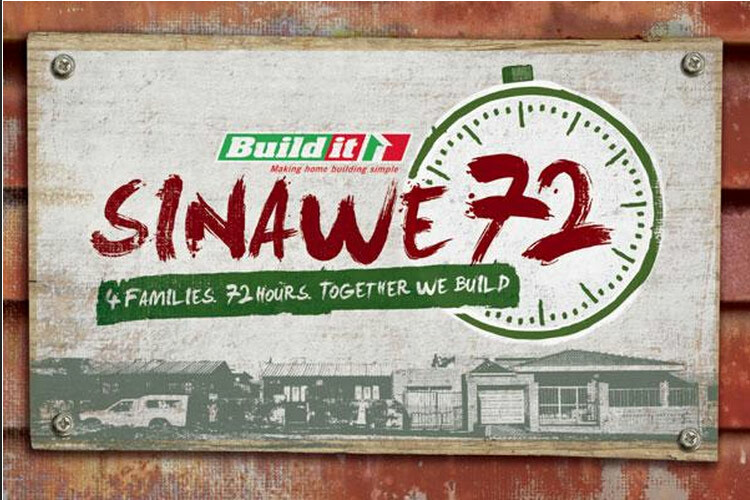 Says Sheridan Scott, Build It’s Production Advisor: “Build It’s new reality show Sinawe72 is about four families that go head-to-head for 72 continous hours, to renovate their homes. The families will get their hands dirty, strategizing, plastering, drilling and battling exhaustion in an attempt to win the R250 000 grand prize”.